RUSH: So there’s another meeting at the White House. Trump is talking to state and local officials today about school safety, and during the break, I heard him. He was talking to Pam Bondi, who is the Florida attorney general, and Trump was discussing additional stimuli for kids that could not be healthy. 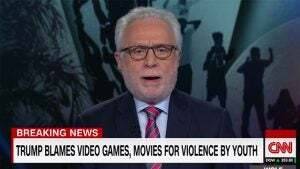 He mentioned the possibility of video games and other things — movies on the internet and so forth — as things that could be in the mix in determining why the shooters do what they do. CNN puts a graphic up to describe this, and you just know that the intention of their graphic had an unstated addition, which was: Trump is insane. 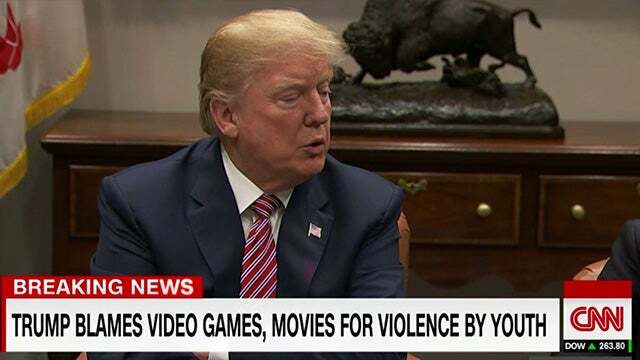 “Trump says video games and violence on internet,” whatever else it was, “responsible for gun shootings, responsible for school shootings,” or whatever. Now, it was factual. It was true. That is what Trump said. But, within the context of CNN, CNN thinks there’s only one culprit here, and that’s guns. Well, a second culprit is the NRA — and anything other than that, whenever anybody says, “in addition to” or “instead of guns, we might want to take a look at…” Like, when they mention mental illness. When Trump mentions mental illness, they pooh-pooh that. So the ongoing intimations from CNN is that Trump continues to be crazy, that Trump is unhinged, that Trump is dangerous. It is this arrogance and this conceit and this condescension that the media use in reporting on Trump. I don’t think they realize how it is not persuasive. But if that’s true, if the media is blowing it, if the media has finally jumped the shark — if the media is reaching a tipping point — then how is it that they can convince 75% of the American people that a tax cut is a tax increase? I don’t think the media is in danger of destroying itself, folks, and I wouldn’t fall back on that realization or on that belief. Now, it may look… If you look at things in a sterile environment and you know things are true, things are not true. And if you have a good foundation of morality, right and wrong, then you look at CNN, you can look at the Drive-By Media, and you can clearly assess that they’re dishonest, that they are biased, that they are factually incorrect, that they intentionally attempt to destroy people who do not agree with them. Yeah, all that’s true. And in normal circles, that would destroy the media because people think the media’s fair, objective, and simply reporting facts and so forth. But I don’t think the media’s on its way to destroying itself, and I would not… If you hear anybody say so, I’d be very guarded about it. As I say, in a sane world they would have destroyed themselves long ago. After the Dan Rather incident, just for one example, and the fake National Guard papers about George W. Bush. I’m sure you can think of countless other examples where their credibility ought to be nonexistent. They should be a national joke right now. But despite that, they can report that the Trump tax bill is gonna raise your taxes and raise taxes on 80% of the American people. And then the Democrats like Pelosi and Schumer run out and start repeating this happen. And the media goes and gets its think tank guests and its economics expert guests. And they all say the same thing, that the Trump tax cut is gonna cause you to pay more in taxes. And then 75% of the American people believe it! And then there are polls while the bill’s being debated that 75% of the American people oppose the passage of the tax cut. How can that be if the media is blowing up? How can that be in the Drive-Bys are destroying their reputations? There is an outlier possibility. The outlier possibility is that even the polls that they’re reporting are BS. Maybe it’s true that 75% of the American people did not oppose the tax cut. Maybe they made that up too! But now the polls are starting to show that, finally, 51% of the American people support the tax cut. Or that Donald Trump’s tax cuts are gonna raise taxes for you and cut taxes only for the rich and Big Business and people end up believing that stuff, I just wouldn’t… I wouldn’t subscribe to the idea that they’re imploding. They ought to be. In a sane, just world, outfits like CNN and MSNBC would be scraping the bottom of the barrel — and in terms of ratings, they are. That’s another curious and odd thing. When it comes to the ratings, they are at the bottom of the barrel, and yet they remain the most powerful force that we are up against. He said, “I just saw today before this meeting that you can walk into a store and walk out in five minutes and have an AR.” It’s an internet hoax. It’s bought and made up. 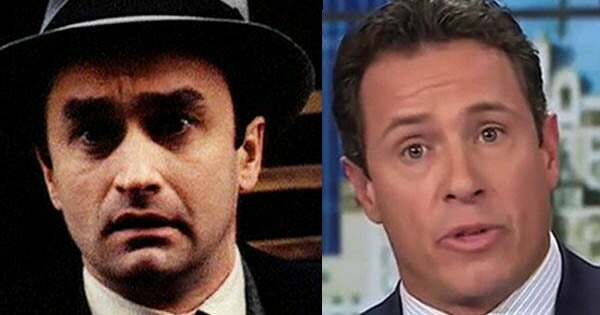 Fredo Cuomo fell for it. When it was pointed out, Fredo said, “No big deal” and dropped it. And the student from the high school in Parkland, Florida, there he is repeating it in the White House, and nobody corrected him. I guess the atmosphere just wasn’t right. I guess it wouldn’t have made sense to tell the grieving student that that wasn’t the case, because people on that side of the aisle would react emotionally. It just wouldn’t have worked. So it stood, and anybody watching it yesterday now thinks that you can go into a store anywhere and buy an AR-15 in five minutes. Background checks take days, folks, is the point here. Saying you can get one in five minutes is an internet hoax.